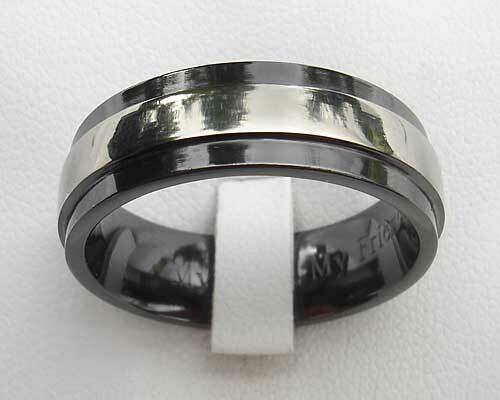 Men's Black Wedding Ring In A Twin Finish : LOVE2HAVE in the UK! Here we have another of our stepped profile wedding ring designs for men, but this time with a more squared off profiling rather than the machined smoothed edging featured on our other models. We think that this design has a far more manly appearance with its less than delicate shaping. It is a two-tone twin finish zirconium ring with a raised centre rail, and we have it shown here in a 7mm width version in an all over satin finish. It can also be done in a gleaming finish too. This ring is just one more example of a ring you will have trouble finding on the High Street compared to an endless choice of unique wedding rings that you can find on the internet. All our zirconium rings make great wedding rings for men as they are designed to last a lifetime, and they all come in a variety of prices for everyone to afford. 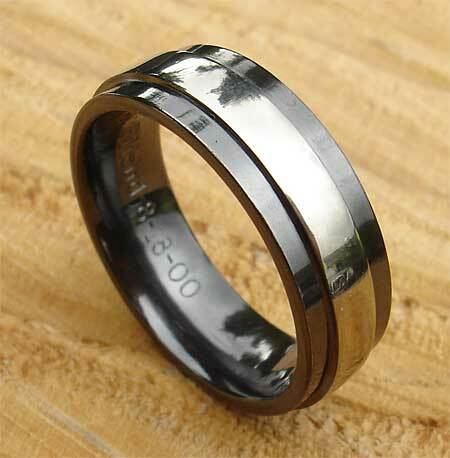 Whatever your budget your zirconium ring will be a wedding ring you will want to look at again and again.